Being the history teacher, as well as having played one of the sisters in Meet Me in St. Louis, I felt the need to explain the importance of this song to my 7 year old. 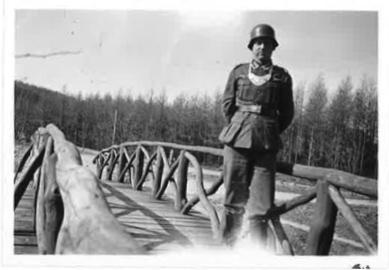 My daughter’s Great Grandfather Valdimar who died in a prisoner of war camp in Cherepovets. The conversation got me thinking. All of my favorite Christmas songs are born out of World War II: White Christmas, I’ll be home for Christmas, Have Your Self a Merry Little Christmas, What are you doing New Year’s Eve. All of them are slightly melancholy; all of them are rife with wishings for things untainted by the horrors of war. Not that I don’t enjoy a good Christian Christmas carol, there is just something about these popular tunes that I identify with. Maybe it is because I am so far away from family during the holidays. So what about Germany during the war years? Did they have popular tunes that reminisced about the Christmases of old? Christmas time is sacred to Germans. It is the most holy, most important, holiday of the year. They even celebrate Christmas for two days: December 25th and 26th. Here in lies the dilemma, the Nazi party wasn’t really pro-Religion. They wanted people to be self-reliant, rather than be reliant on a belief system. And if the party was saying Jews are bad, it might be difficult for them to reconcile their political beliefs with their need to celebrate the birth of the King of the Jews. The propaganda machine therefore had to churn out messages that focused more on Celtic or Norse winter rituals than typical Christian celebrations. Fire and light in the dark of winter replaced the traditional motif of Mary and the Christ child. From the 1942 edition of the BDM songbook. The song describes the clear night stars, fire, mountains, as well as the familiar image of a Mother and Child. But all in all, it was pretty secular. This was why the song appealed to the Nazi Party. Oh Tannenbaum was also a favorite with its focus on Nature rather than God. But the Nazi party still felt the need to change a few words to make it more secular. For example the word Weihnactzeit (Christmastime) was changed to Winterzeit (Wintertime). 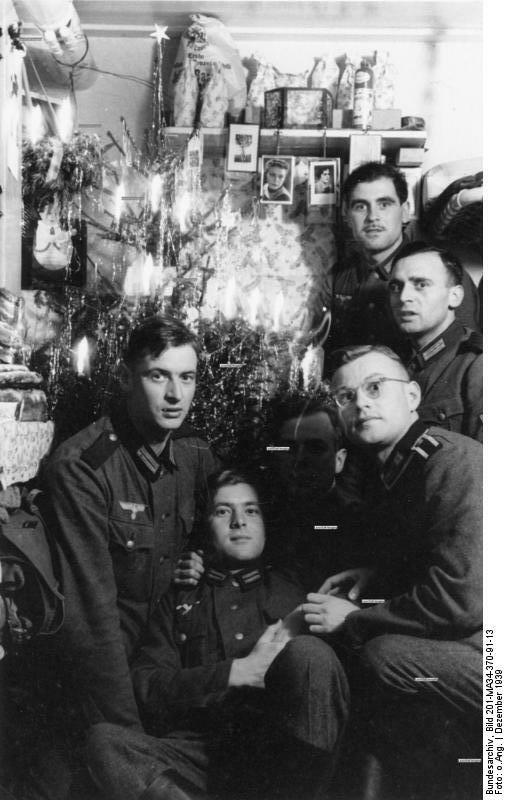 In spite of the Nazi Party’s efforts to take the Christ out of Christmas, the Germans remained true to their traditions. Today most Germans still prefer the religious carols of Christmas over American sounding Christmas tunes. Why sing songs loosely related to the holiday when you can sing of the holiday directly? In spite of how secular Germany may be becoming, Christmas is still a religious observance for all. This is much different from America where Christmas concerts have been replaced by Winter Solstice Concerts. Christmas parties in schools are now Holiday parties. Now watch it again, but this time disregard the German language, the high mountain scenes, and the uniforms. Just look at the people. I got a little choked up actually. I know, I know. This was a propaganda film made to uplift the German Volk in the face of the harsh winter at Stalingrad and the losses at El Alemain. But still. If you change the language and take away the uniforms, those people become us. They are we, not them. They are human. Regardless of which side of the battle lines, mothers still wanted their boys home for Christmas. Which Christmas songs are the most meaningful for you? Do you prefer the popular tunes of the season, or do you prefer the sacred carols of Christmas? I always felt that the German Christmas is in general less…gaudy. It’s not as loud and into your face as the American tends to be – and I admit, it makes me sad every time I see one of the American style decorations on a home. I think the simple star in the window is much nicer. As are self-made decorations, and traditional cookies, and a general more quiet and in-family approach to the celebration. Not that I don’t enjoy anything which comes from America (I especially love “Mary’s boy Child” as Christmas song)…but to me Christmas is still very German, with songs by “Rolf und seinen Freunden”, the good old classics, baking, and more or less every year the same kind of celebration. Funny you mentioned Rolf. When we were trying to think of a German Pop Christmas song, the only one we could think of was “In der Weihnachtsbäckerei”. lol….though I like his first Christmas CD the best. My own grandfather was involved in that first Christmas truce, the one with the football matches, and when they made a film about it that Christmas, too, is seeped in the same songs you have mentioned. I think the piped in Christmas music doesn’t really happen until late November in the states. But it has been awhile since I’ve been home at this time of year. Wow, cool to have the Christmas Truce as part of the family history. You are very lucky in that you have Thanksgiving – here they get the tinsel out the moment the swimsuits are sold! I get sentimental over Louis Armstrong, Ella Fitzgerald type Christmas songs. They always make me feel homesick for America at this time of year. Ella’s Swingin’ Christmas is my favorite. 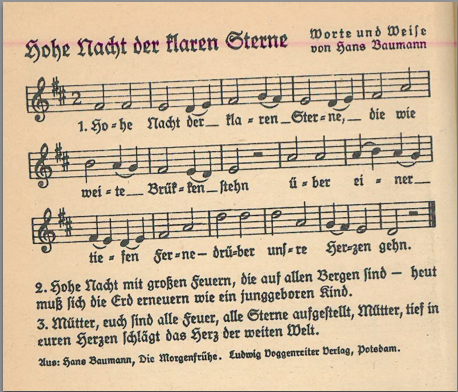 My favorite German Christmas carol is “Leise Rieselt der Schnee”. I can practically feel the quiet, falling snow in the forest around me when I sing it.